Google Glass gets a bad rap for fear it's ending privacy and normal conversations as we know them. 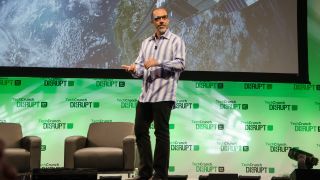 At this week's TechCrunch Disrupt, Astro Teller, head of the Google X moonshot program, took to the stage hoping to clear up misconceptions of how wearable connected technology may negatively impact our lives. "[Google Glass] is the world's worst spy camera," Teller proclaimed. "It's only facing in the direction that you're facing, it lights up when it's taking a picture, it would be hard for a person to use it as a spy camera." "For the foreseeable future Glass will continue to be the world's worst spy camera, if you're looking to spy on people I can point to some other products," he said, jokingly listing off other devices like smartwatches with built-in cameras and rice-grain-sized cameras that can fit in a shirt button. Teller also used his time on the Distrupt stage to dissuade myths that Google Glass is another device that will consume users' attention, furthering the separation between our physical and digital lives. "I share that worry with those people, so does everybody on the Glass team," Teller said. "The moonshot for Google Glass is to harmonize the physical and digital worlds." "It is specifically to find a way to help people be naturally, elegantly situated physically and digitally at the same time, Teller expounded. Rather Teller sees Google Glass transcending beyond technology to become an integral part of our lives, one that enriches everyone's day in the same way regular glasses did over 700 years ago. "Google Glass is not all the way there but it's a good thing to aspire to and that's the journey that Google Glass is on," he said. What is it like to hangout and ride a bike with Google Glass? We find out.